Thanks to a new 10.5-inch AMOLED display, the Tab S4 is not only physically larger than its predecessor—its battery has been upsized by 20 percent to 7,300 mAh, so its longevity should improve as well. 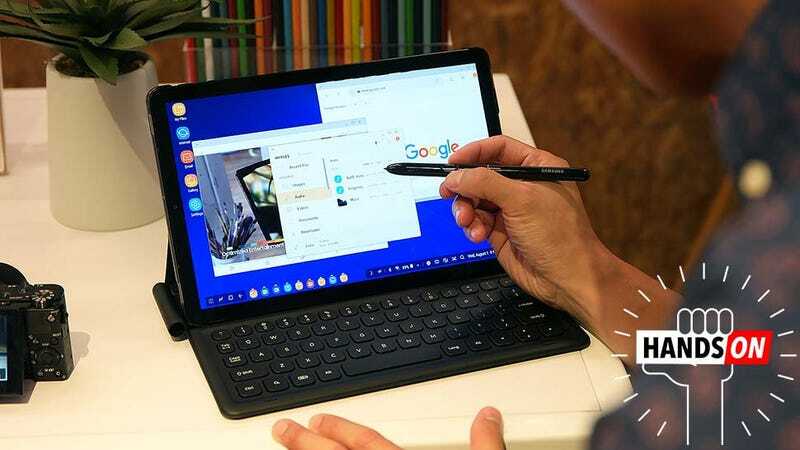 However, the biggest change for the Galaxy Tab S4 is the inclusion of Samsug’s Dex software to provide something close to a true desktop working experience no matter where you are. And here’s you standard tablet mode. On top of full support for all your favorite Android apps, you also get a task bar and notification drawer at the bottom while in Dex mode. You’ll even see icons on the desktop for frequently used programs. As you’d expect from a regular laptop, you can run multiple things in the background (up to 20), with easily re-sizable windows and the freedom to drag-and-drop files where you please. When you want to switch back to tablet mode, just hit a button in the S4's notification panel, or set it to revert back whenever you disconnect its keyboard. Included in the box is the Tab S4's stylus, which Samsung says draws power from the screen and doesn’t need to be charged. Like we’ve saw on last year’s Tab S3 and previous Galaxy Note phones, the S4's stylus can handle a number of tricks such as screen-off memos—letting you jot down notes without needing to unlock the device—Air Command for all your screenshot and on-the-fly gif making needs, and even live translation. Unfortunately, the Tab S4's keyboard does not come bundled. Instead, it’s an extra that costs another $150. That’s a real shame because the optional keyboard actually feels pretty good. It’s got more key travel and bounce than what you get from one of Apple’s Smart Keyboards for the iPad Pro, though Samsung also made the mistake of not including a built-in touchpad. Sure, you can always bring your own keyboard into the mix, but to truly maximize the Tab S4's mobile productivity, a keyboard kind of feels like a necessity. For people who really want to go for a full desktop-like experience, you can connect the Tab S4 to an external monitor using a USB-C to HDMI dongle (which is another optional extra) to get a big-screen view in front while the Tab S4's display functions as a secondary screen. As for the rest of the Tab S4's specs, it’s got a somewhat underwhelming mix: an older Snapdragon 835 chip, 4GB of RAM, 64GB of storage, 13-MP rear camera, and micro-expandability. That’s essentially the same components as what you got on last year’s Galaxy Note 8, but with 2GB less RAM. There also isn’t a built-in fingerprint reader, which means you’ll have to rely on the iris reader or stick with an old-fashioned PIN or password. But why didn’t Samsung just go with something like Chrome OS? You’d still have the same support for Android apps and a UI built for productivity, but without all that complicated Dex-ness. A Samsung representative told me that, as a tablet, Android made more sense for the Tab S4 and that Samsung is “committed” to Android. As for me, I’m not quite as convinced. At this point, it’s clear that outside of Apple, tablets are moving towards Chrome OS. My main concern is the Tab S4's price. Starting at $650 without the keyboard cover and monitor dongle, the Tab S4 is considerably more expensive than a Surface Go and about the same price as a 9.7-inch iPad Pro. In my short time with the Tab S4, it felt like a totally competent device, and with the addition of Dex to make performing certain productivity-minded tasks a little smoother, it’s definitely a more well-rounded device than the Tab S3. But I still feel like Samsung could do better. Either way, stay tuned for more in-depth impressions. The device should hit stores on August 10.